Los Angeles (AFP) – Sony’s family film “Jumanji: Welcome to the Jungle” continued to stomp the competition at the North American box office, taking the top spot for the third straight week, according to industry estimates Sunday. 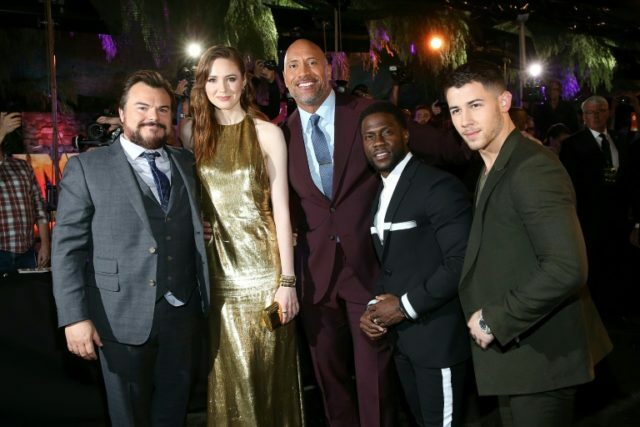 “Jumanji,” starring Dwayne “The Rock” Johnson along with funnymen Jack Black and Kevin Hart, netted just over $20 million for the three-day weekend, bringing its total to $317 million in its fifth week out, industry tracker Exhibitor Relations reported. The film follows four teens who find themselves transported inside the video game world of Jumanji. Debuting in second place was “12 Strong” from Warner Bros., starring Chris Hemsworth, about US Special Forces deployed to Afghanistan after the September 11, 2001 attacks. It had a take of $16.5 million. Gritty heist thriller “Den of Thieves” from STX Films was third on the list in its debut weekend, with $15.3 million. The movie, starring Curtis “50 Cent” Jackson and Gerard Butler, follows the intersecting lives of the major crimes unit of the Los Angeles Sheriff’s Department and an elite band of robbers. Fox’s “The Post” dropped to fourth place from second, after pulling in $12.2 million over the weekend for a total take of $45.2 million in four weeks. The political thriller recounts the nail-biting behind-the-scenes story of the 1971 publication by the Washington Post of the Pentagon Papers, which exposed the lies behind US involvement in the Vietnam War. “The Greatest Showman,” a Fox film about larger-than-life circus impresario P.T. Barnum, netted $11 million to take the fifth spot. It has taken in $113.5 million in five weeks.